A long-vacant lot near Montrose and Cicero avenues would be transformed into a 16-unit apartment building. 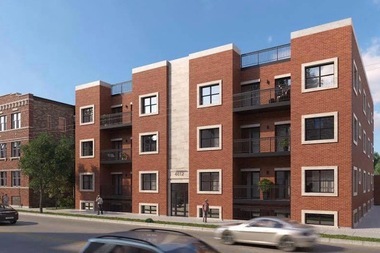 PORTAGE PARK — A long-vacant lot near Montrose and Cicero avenues would be transformed into a 16-unit apartment building, according to plans unveiled by Ald. John Arena (45th). Two of the apartments set to be built at 4812-18 W. Montrose Ave. would be set aside for low-income residents as required by the city's affordable housing ordinance. The project requires a zoning change, which needs the support of Arena and the approval of the Chicago Plan Commission. A community meeting to discuss the project from developer Dominic McGee is set for 6:30 p.m. Monday at St. John's Lutheran Church, 4939 W. Montrose Ave., Arena said. The project includes 16 parking spaces, said Owen Brugh, Arena's chief of staff. A three-story apartment building is directly west of the 14,200-square-foot parcel, and a Citgo gas station is directly east. The Montrose stop on the CTA Blue Line is a short walk, as is the Mayfair station on Metra's Milwaukee District North Line. Both the Montrose and Cicero avenue buses stop nearby. Arena often has touted his support for projects that give people a chance to live near mass transit hubs and business districts. But his policy is not to take a position on the development until after the community meeting. Existing rules would allow eight apartments or condominiums to be built on the site, along with four storefronts, officials said. Three projects have been proposed for this property since 1999. A proposal to build two three-story buildings containing 12 apartments fell apart in October 2014. At the time, nearby residents said they would rather have condominiums built on the empty lot and said they were concerned the development would snarl traffic in the alley behind the property, which many people use to bypass gridlocked Montrose and Cicero avenues. The lot is now used as a parking lot. In 2010, a plan to build a one-story shopping center never came to fruition. A 1999 proposal to build 14 condominiums on the property was scuttled by community opposition, officials said.